Carbon-Carbon Bond Forming Reactions. Carbon-carbon single bonds. Carbon-carbon double bonds. Carbon-carbon triple bonds. Cyclopropanations. Thermal and photochemical reactions. Aromatic substitutes forming a new carbon-carbon bond. Synthesis via organometallics. Rearrangements. Oxidations. C-O oxidations. C-H oxidations. C-N oxidations. Amine oxidations. Sulfur oxidations. Oxidative additions to C-C multiple bonds. Phenol-quinone oxidations. Dehydrogenations. Other oxidations. Reductions. C=O reductions. C-N multiple bond reductions. Reduction of sulfur compounds. N-O reductions. C-C multiple bond reductions. Hetero bond reductions. Reductive clevages. Reduction of azides. Other reductions. Synthesis of Heterocycles. Oxiranes, aziridines and thiiranes. Oxetanes, azctidines and thietanes. Lactams. Lactones. Furans and thiophenes. Pyrroles, indoles etc. Pyriidines, quinolines, etc. Pyrans, pyrones, and sulfur analogues. Other heterocycles with one heteroatom. Heterocycles with a bridgehead heteroatom. heterocycles with two or more heteroatoms. Other heterocycles. Reviews. Protecting Groups. Aldehyde and ketone protecting ggroups. Almino acid protection groups. Amine protecting groups. Carboxyl protecting groups. Hydroxyl protecting groups. other protecting groups. Useful Synthesis Preparations. Functional group preparations. Additons to alkenes and alkynes. Boron compounds. Nucleotides and related compounds. Phosphorus, selenium and tellurium compounds. Silicon compounds. sulfur compounds. Tin compounds. Reviews. Tehcniques. Asymmetric synthesis and molecular recognition. Reactions. Reactive intermediates. Organometallics and metalloids. Halogen compounds and halogenation. natural products. Others. Selected Topical Areas. Fullerene chemistry. Taxol and related taxane chemistry. Dendrimers, calixeranes and other unnatural products. Total syn. of selected natural products. Reactions in polar media. Combinatorial chemistry. 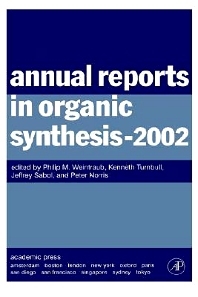 This highly organised annual serial provides a clear general review of structure/activity information for each synthetic compound discussed, clearly illustrates structures of compounds in every feasible synthetic pathway, and provides references to the primary literature for each reaction discussed. This latest volume provides easy access to solutions to specific problems faced by chemists involved in synthesis and provides information on recent synthetic advances, thereby helping to relieve the information overload that can be encountered in this field. The first three chapters of this latest volume organise Carbon-Carbon bond forming reactions, Oxidations and Reductions into reaction types for easy location. Later chapters deal with synthesizing heterocyclic systems, the use of protecting groups, other synthetically useful transformations and specific topic reviews. The final chapter compiles titles and papers within a "hot topic" format and although by no means inclusive, the listing provides a much needed useful reference to these topical areas. For organic, medicinal and polymer chemists in academia and industry.